In 1968 the Russian communists came to Prague with guns and tanks blazing. They are not credited with doing much good in Prague. But there is one thing that they did really well and that is the Prague metro. 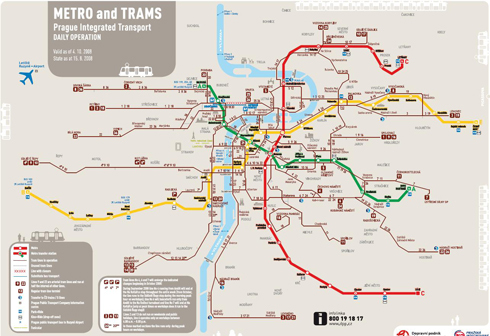 As you can see from the map there are three metro lines. They crisscross the city and touch on almost every section. You can get just about anywhere in the city via metro. The three lines interchange near the center of Prague, forming a kind of metro ring road around the center. Besides walking the second best form of travel within the city is the metro. It is fast, reliable and safe. Besides the peak hours in the morning with people going to work and in the early evening, people going home, the metro is not crowded. At the time of construction the communists were worried that Prague might be targeted by the West as a great place to drop a nuclear bomb. So they created the metro deep underground to doubly serve as a nuclear bomb shelter. So some of the escalators down to the metro are the largest I have ever seen. Also the metro had to be built deep underground because it goes under the old buildings and river. And at the cross over stations the metro lines are stacked one on top of the other. So if you get out at one you will need to either go further down or up a level to get to the other station. The metro system is very easy to understand. Just remember that there are three lines. Red, green and yellow. They all intersect near the center of town. It does not matter which line you start off on – you can always get to any other one. And they all go to the center of town. Walking down into the metro station you will be faced with two options. You either stand on the left platform or on the right one. At the center and above each platform is an easy-to-understand map. It has all the stations for the line. The circled and bold station is the one you are presently at. To the right of the circled station are all the stations that the right platform metro will take you to. To the left of the circled station are all the stations that the left platform will take you to. If you need an overall picture of the entire metro system then have a look at the metro map at the center of the platform encased in glass. It will show you were you are and which stations make a cross over to another line. The cross over stations are: Florence, Muzeum and Mustek. Buying a metro ticket can be a daunting task. There are so many buttons on the ticket machine. And there are so many possibilities. It is broken up into zones and times. So you can get a ticket valid for 20 minutes and 2 zones or a ticket valid for 90 minutes and 4 zones. When you come to the machine have an idea where you are going and how long it should approximately take. Look for number of stations and time duration. I never know so I just press the 90 minute button and get a ticket. Better safe then trying to save a few Korun and then having to argue with the Metro authority. Just remember that getting a ticket is a two-step process. First you buy the ticket then you need to validate it. At the entrance of the metro zone are little yellow boxes. Insert the ticket into the box to get it time stamped. If you have your mobile phone then a really easy way to buy a ticket is to send an SMS. Simply send an SMS to the number 902 06 26. In the message, type in 'DPT'. Within seconds your phone account will be debited and you will receive an SMS metro ticket. If you are stopped by metro authority simply show them the SMS. The ticket is valid for 90 minutes for the entire Prague metro system. The ticket is valid for child or adult and even dog.